San Francisco City Hall Elopement. 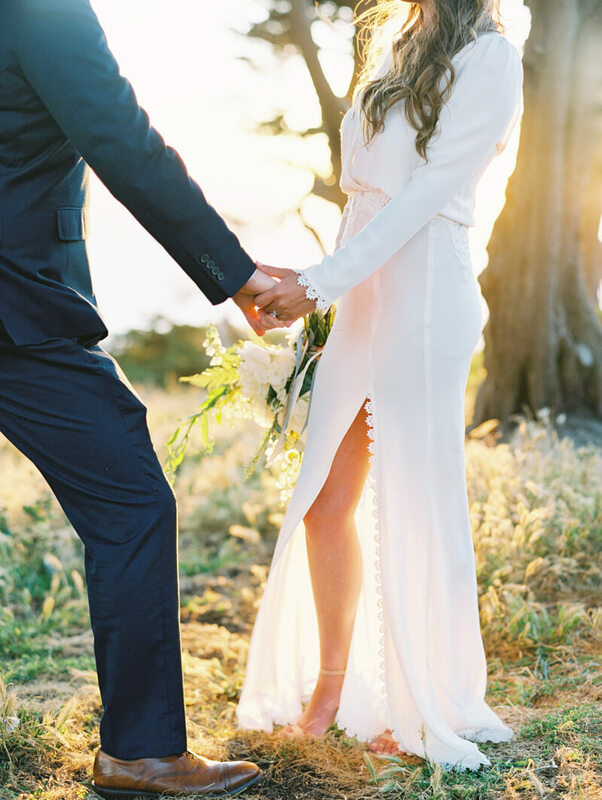 Cat and Joe wanted a simple, sophisticated, San Francisco wedding! 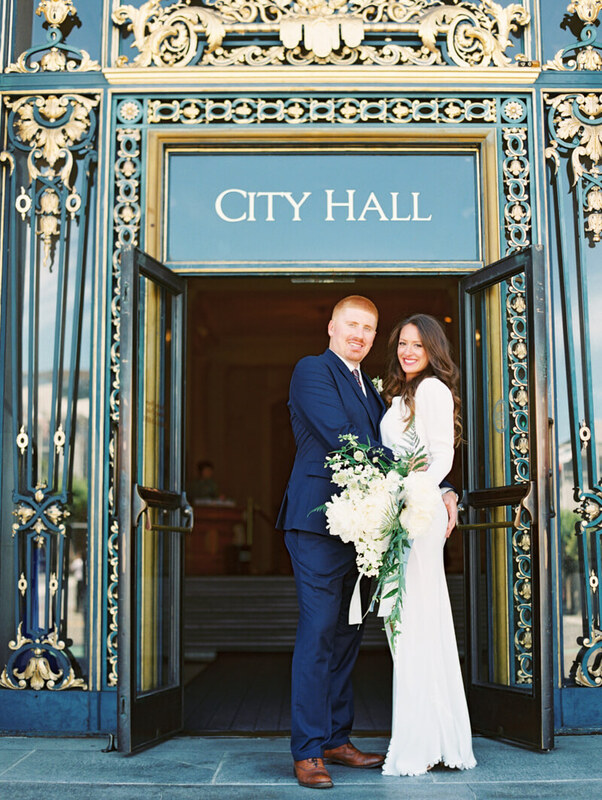 They planned a no-fuss elopement at the enchanting City Hall. And while there were many couples getting married that day, Cat and Joe reserved the fourth-floor balcony so they could enjoy their intimate ceremony with their closest family and friends. Cat, ever the fashion-forward bride, wore jaw-dropping heels for her big day. The colorful chevron beading made a stand-out appearance. Inside the rotunda, the exquisite architecture and stately design requires no additional outside influences – it’s impressive on its own. Cat wore a long-sleeved gown with an open back and a side slit, perfect for showing off her dazzling heels. The dress also featured lovely detail on the wrists and bodice for a feminine finish. Her bouquet was an elegant collection of oversized blooms, tied with light blue silk ribbons. 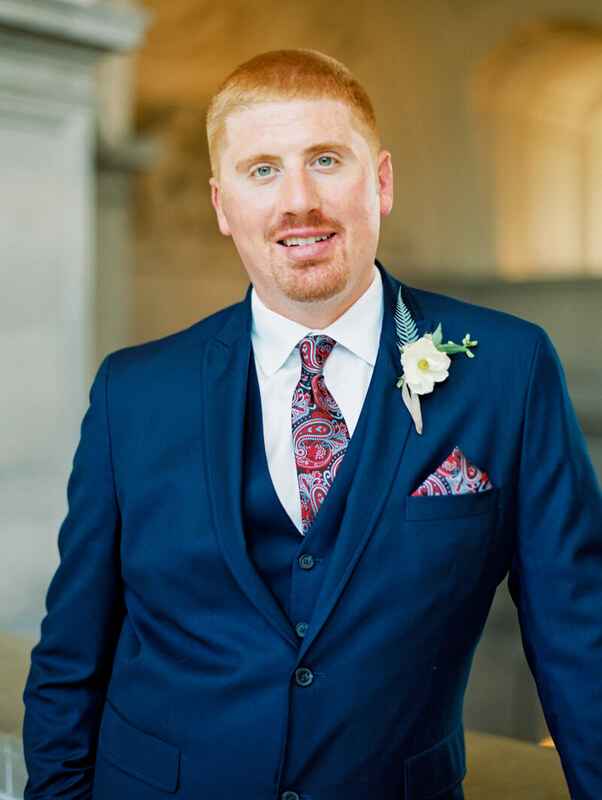 Joe chose a blue tuxedo and used a colorful tie and matching pocket square to bring his look to life. Only a small group, including their parents and their friend/professional photographer, witnessed their nuptials. And Cat and Joe were elated as they sealed their vows with a kiss. They took advantage of this crown jewel of a location and captured a few photos inside and outside. After the ceremony, the couple and their guests headed to a local restaurant for a small celebration. They shared laughs, toasts and even slices of a one-tier wedding cake made just for them. As the sun began to dip, they made their way down to the Sutro Baths and Lands End area to capture a few sunset photos in between the trees. Some couples opt for huge weddings and for others, the smaller the better. 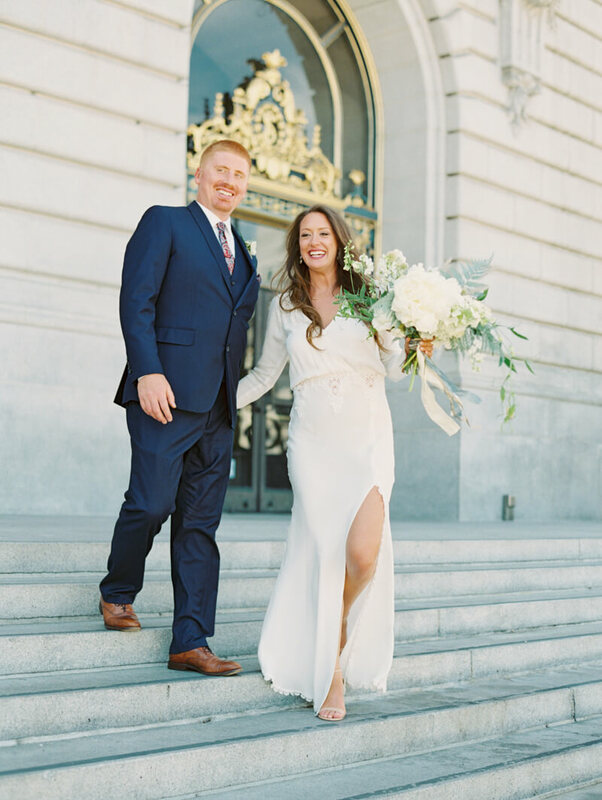 Cat and Joe knew they wanted a simple elopement in San Francisco and they capitalized on the gorgeous City Hall building to make it happen. With just a beautiful dress, bouquet, bride, groom and a few guests, their day was simply perfect.